As the state's top elected officials debate how to halt a surge of immigrants across the border, health officials and volunteer doctors are voicing concerns over what they say is the more serious challenge: a looming medical crisis. As the state's top elected officials debate how to halt a recent surge of immigrants — many of them unaccompanied minors — across the Texas-Mexico border, health officials and volunteer doctors are voicing concerns over what they say is the more serious challenge: a looming medical crisis. During a recent visit to two detention centers that house undocumented migrant children, officials with the Texas Department of State Health Services (DSHS) reported that conditions there posed a high risk for infectious disease outbreaks. Meanwhile, doctors providing medical care for immigrants being released by U.S. Border Patrol ahead of their court dates say those recent detainees were not appropriately screened or treated for illness while in federal custody. Since October, authorities in the Border Patrol's Rio Grande Valley sector have detained an unprecedented 160,000 undocumented immigrants, including more than 33,500 unaccompanied minors. These immigrants were transferred to federal detention centers, where they have been held temporarily. During a tour of detention centers in Brownsville and McAllen last week, state public health officials identified several health-related issues, including a lack of medicine for child immigrants, no comprehensive medical screenings and no testing for vaccinations or tuberculosis. Officials with the U.S. Department of Homeland Security said Customs and Border Protection agents conduct medical screenings for several symptoms — rash, fever, cough, vomiting and diarrhea — shortly after detainees come into federal custody at border patrol stations. Once the immigrants are transported to detention facilities, they are screened “for signs of illness consistent with communicable diseases of public health concern,” agency officials say. But state officials said the medical screenings are not sufficient because they’re only being conducted on a verbal and visual basis. DSHS also raised hygiene concerns, reporting that children eat, sleep and use the bathroom in the same crowded cells, and have no running water or soap. While DSHS does not have figures about diseases diagnosed among child detainees, the department has recommended that “mass shelter standards” be followed to avoid spreading conditions like scabies, head lice and conjunctivitis. 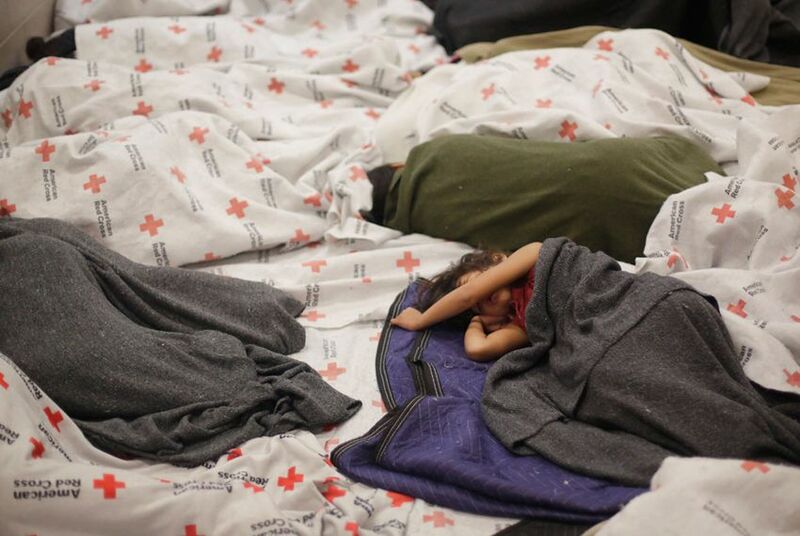 The Department of Homeland Security says unaccompanied minors in Texas receive more ”advanced medical assessments” and care once they are moved from detention centers into one of the state's 29 federal emergency shelters. At the shelters — which are managed by private companies or nonprofit organizations and financed by the U.S. Department of Health and Human Services’ Office of Refugee Resettlement — they go through a “well-child exam” and are given childhood vaccinations “to protect against communicable diseases.” They are also screened for tuberculosis and quarantined if they are diagnosed with a contagious disease or found to have been exposed to it. Outside of detention centers, doctors along the border are also sounding the alarm, saying immigrants being released from detention — and primarily mothers and children — are coming out in rough shape. In McAllen, Dr. Martin Garza has been volunteering at the Sacred Heart Church, where Catholic Charities of the Rio Grande Valley has set up a makeshift assistance center to offer immigrants medical assistance, meals, showers and clothes. The church is about a block from a bus station where Border Patrol agents drop detainees off with travel vouchers once they have been assigned court dates. In the last week, Garza and at least three other doctors say they have treated hundreds of recent detainees for abdominal pain, skin abrasions and dehydration. Eddie Olivarez, director of the Hidalgo County Health Department, said officials there have counted five cases of chicken pox and one “concern” about potential tuberculosis among the recent detainees. Garza said some immigrants awaiting their court dates get on buses and go as far as New York, Ohio or Florida. “Today it’s an Hidalgo County problem," he said. "Tomorrow there’s going to be a Houston problem." On Monday, the Texas Medical Association called on the Obama administration and Gov. Rick Perry to help provide medical aid for the immigrants by assigning more physicians to the border to provide vaccinations and comprehensively screen all individuals coming into the country. Texas’ Republican leadership has largely blamed the federal government for the crisis, and has directed the Texas Department of Public Safety to increase its efforts along the border with Mexico — an initiative estimated to cost $1.3 million per week. But state lawmakers are also worried about the public health concerns associated with the influx of immigrants. Republican state Sen. Jane Nelson, chairwoman of the Senate Health and Human Services Committee, said the federal government should prioritize addressing a “growing public health problem” along with its efforts to reinforce security along the state’s border. “When individuals are held in unhealthy conditions and then released into the community without proper medical attention, the health of Texans is placed at risk,” Nelson said. Julian Aguilar contributed to this story. The Texas Medical Association is a corporate sponsor of The Texas Tribune. A complete list of Texas Tribune donors and sponsors can be viewed here.